The heart of an Antarctic volcano. The steamy jungles of the hidden Savage Land. Coastal Japan in flames and the far-flung Canadian city of Calgary buried in drifts of snow. All these locales and more await our merry band of mutants in the following eleven issues- and there's no time to catch your breath! This volume reads as one long story, setting the tone for the heavy continuity approach the next two decades would take. The first issue the X-Men wake up somewhere strange and by the end of the book, they still haven't gotten home! Claremont's seminal run on the Uncanny X-Men hits a fever pitch with its third collected volume. Essentially framed around a globe hopping trip, the X-Men run the gamut of some of their fiercest villain in some classic story arcs. The book picks up with the team having been brainwashed by Mesmero into joining a circus freak show (a pithy act of revenge) before the team is taken prisoner by Magneto and whisked away to his base in Antarctica. After a showdown in which Magneto trashes the X-Men (again) the team is split in two. Beast and Phoenix are rescued by the American military and taken home, believing their comrades are dead. 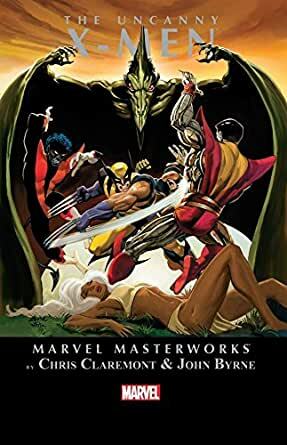 The other X-Men manage to survive but are left stranded in the Savage Land where they team up with Ka-Zar and run up against Sauron before picking up a lift to Japan. There we a return from Sunspot and an introduction to his cousin Mariko (Wolverine's future lady love) before they team up against Moses Magnum and finally catch a flight home. Sadly, before they can be reunited with Jean and Xavier they have one last trial to overcome: a battle against Alpha Flight, Canada's super team. The Canadian heroes are looking to reclaim Weapon X for their government, but the X-Men refuse to give up their friend without a fight. We also learn that Xavier has ventured into space to live with Lilandra and get a flashback to a past experience he had with the first Shadow King. All these classic stories perfectly weave into one another and hold up to this day for the most part. The first Shadow King. The debut of Alpha Flight. Introducing Zaladane. The return of Mesmero, Magneto, Sauron and Moses Magnum. Special guest spots from Ka-zar, Sunfire, and the Daughters of the Dragon. Wolverine falling madly for Mariko. Colleen becoming interested in Scott. Charles and Lilandra in outer space. This one keeps up the pace and doesn't stop, with one crisis and adventure on the heels of the next. The X-men wind from Japan to Scotland to the Savage Land, all while learning more about themselves and each other. John Byrne supplies his best flowing pencils, Dave Cockrum supplies dramatic covers, and Terry Austin inks most of it. This is super hero team hijinks of the highest order , influential for years to come. 5.0 out of 5 starsGreat stories with real depth and the characters are spot on!! Some of the best Xmen stories ever. The wonderful writer made sure each character has his or her moments, and the art is amazing too. If only the modern-day xmen stories were this good!! My older eyes are loving the guided view via Comixology app. And my brain is having a blast reliving these stories! Just an all-around pleasure. From Antarctica to Japan to Canada, this is classic Claremont and Byrne. The story is exciting and cohesive. I highly recommend this book.